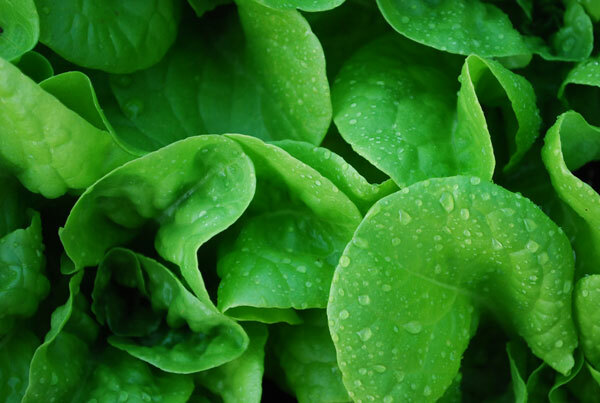 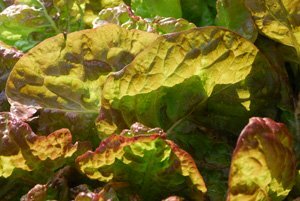 SaladScapes are mixtures of lettuces, spinach, Asian greens, or other salad greens, that are grown for the eye, as well as the palate. 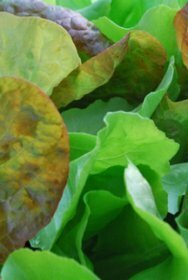 In the spring and fall, when cool-season vegetables thrive, lettuce leaves catch and hold the slanting light, in planes of translucent color. 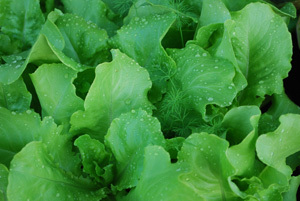 For digital photographers, SaladScapes offer a rich, concentrated exploration of light and form. These quick-growing, cool-season vegetables are shallow-rooted, and can be grown in trays as shallow as 3 ½” (9cm), with a good potting mix. 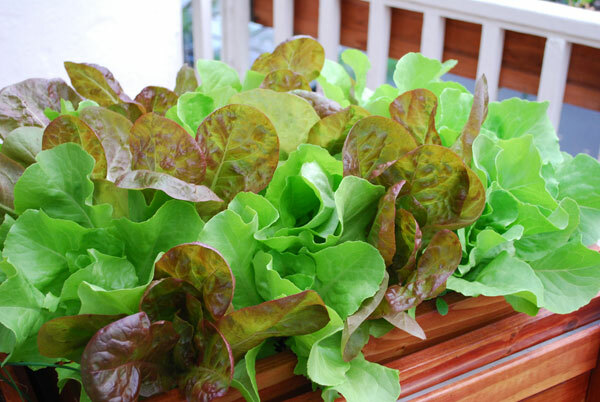 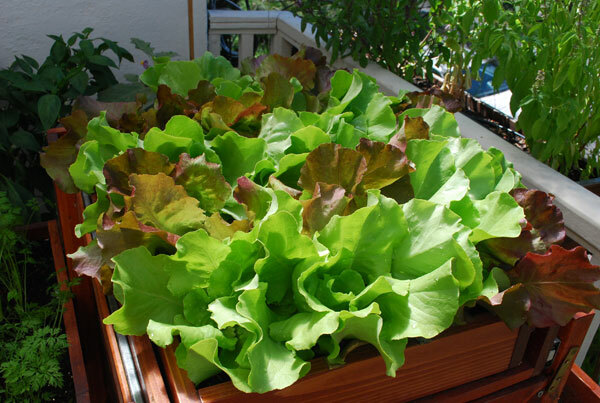 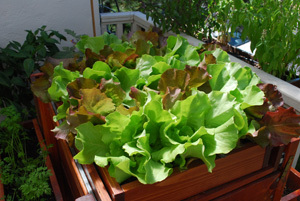 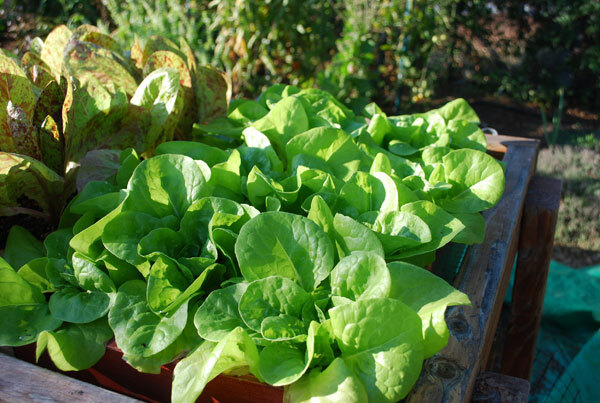 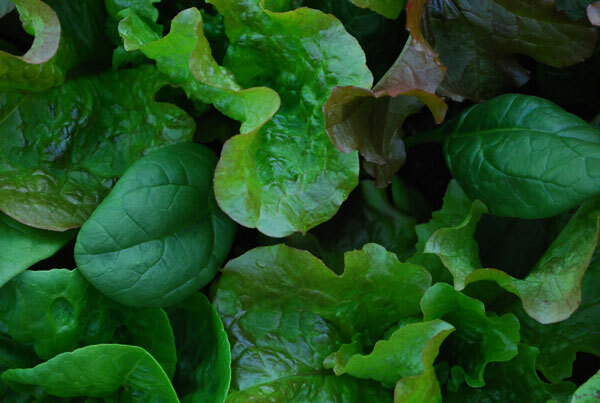 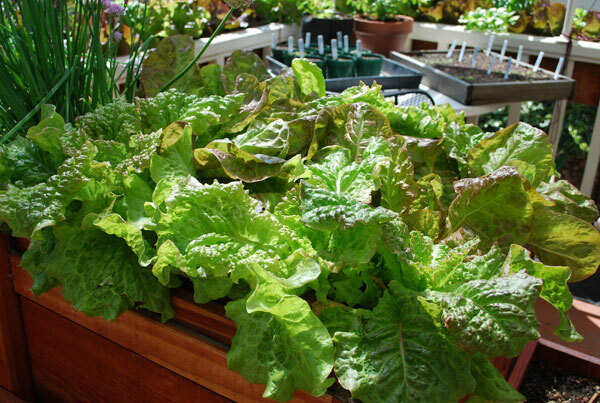 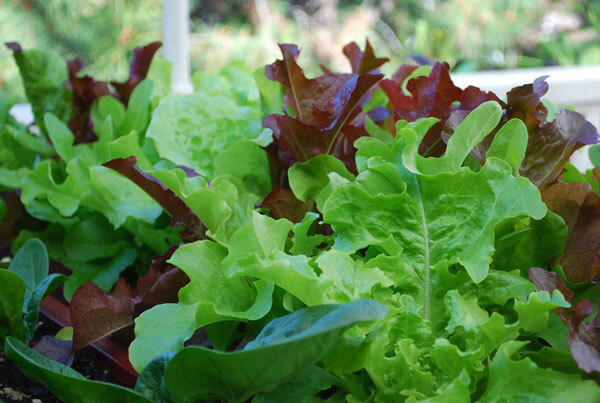 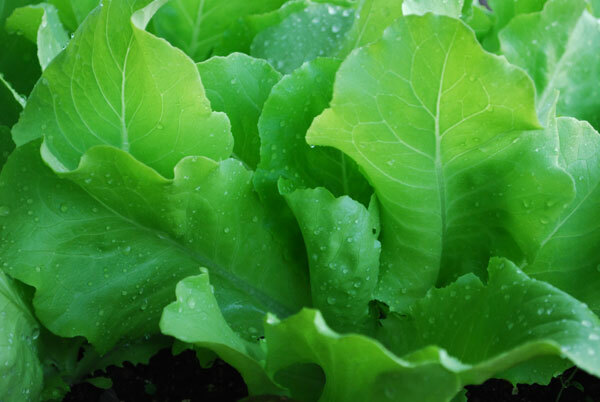 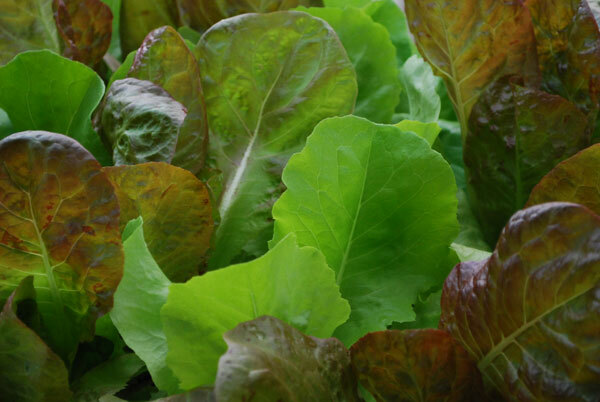 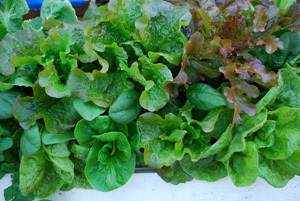 SaladScapes are excellent for cut-and-come-again lettuce culture, where you harvest leaves, and get a second cutting a couple weeks later. 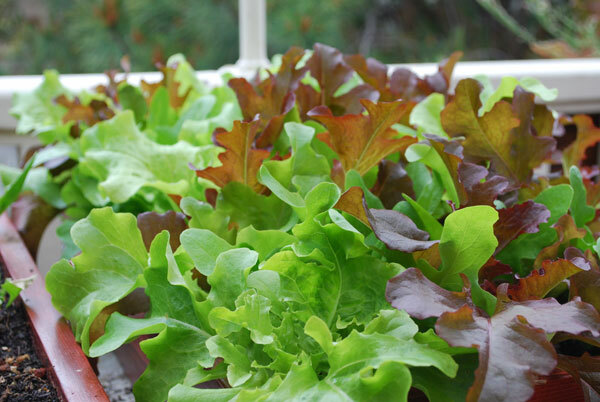 Sometimes, they’re almost too beautiful to eat! For how to grow them, click Here. 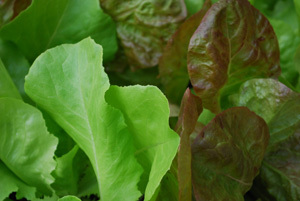 Use Contrasting Colors. 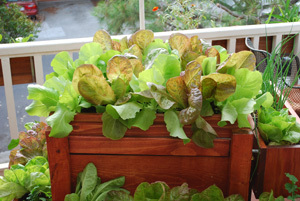 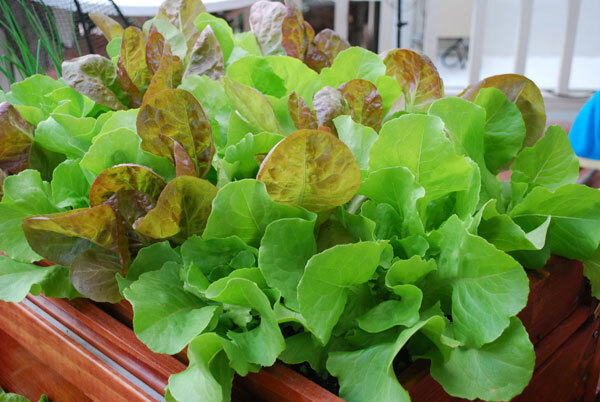 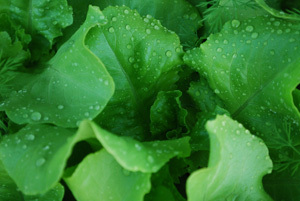 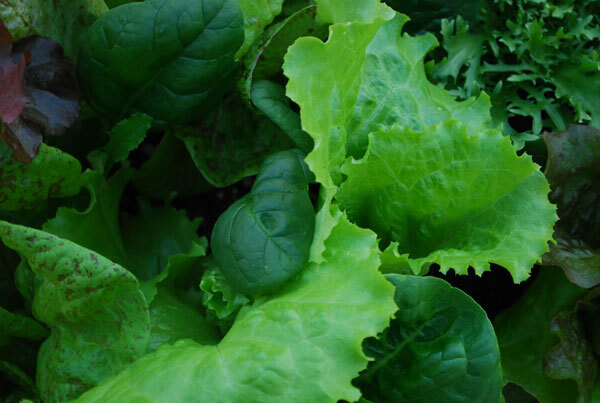 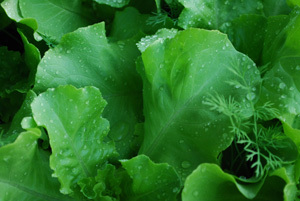 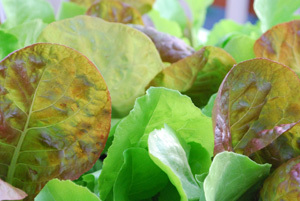 Mix dark green lettuces with light green lettuces. 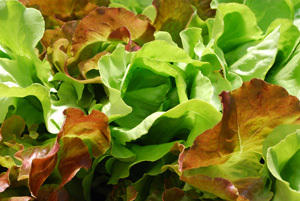 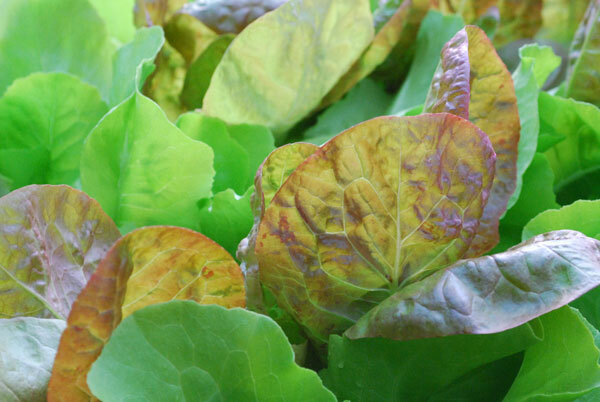 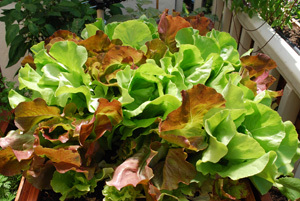 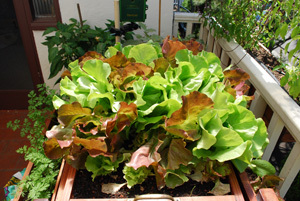 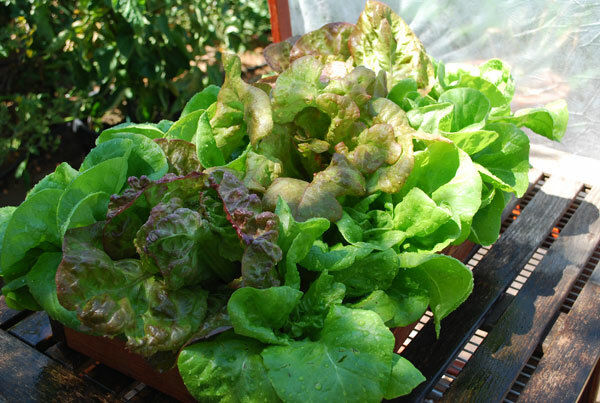 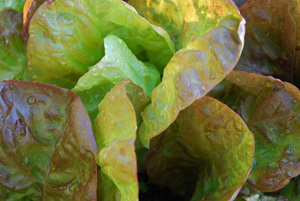 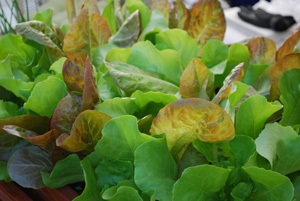 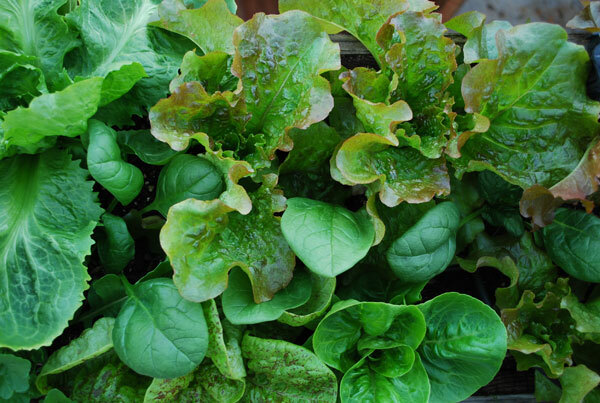 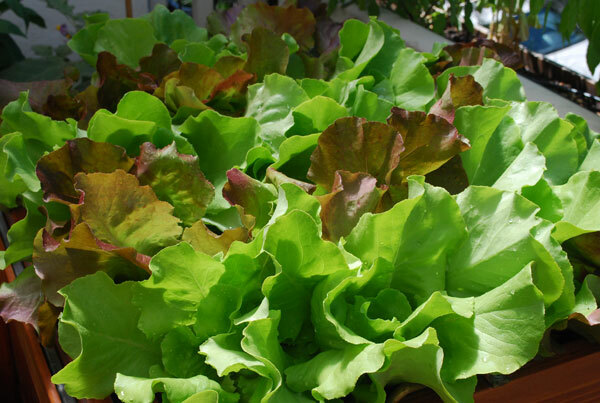 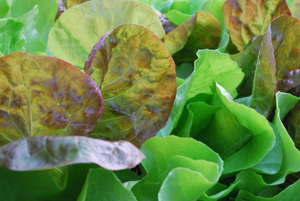 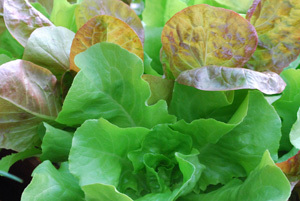 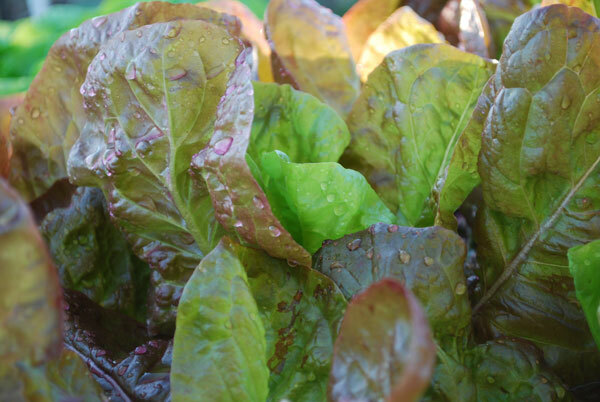 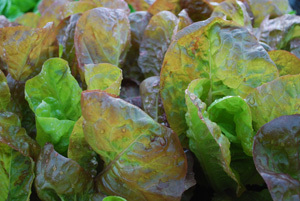 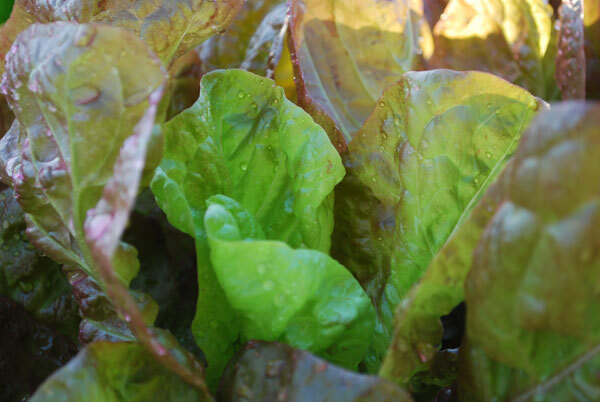 Mix blushed and red lettuces with light butterheads like ‘Santoro’, ‘Torenia’, or ‘Matchless’. Use Pattern, but don’t be a slave to it. Once you set the theme, it’s the slight variations from the pattern that make it interesting. 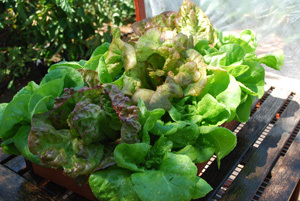 Use different plants, with different foliar forms. Mix frisee with Asian tatsoi, mizuna with spinach, butterhead lettuce with raddichio. 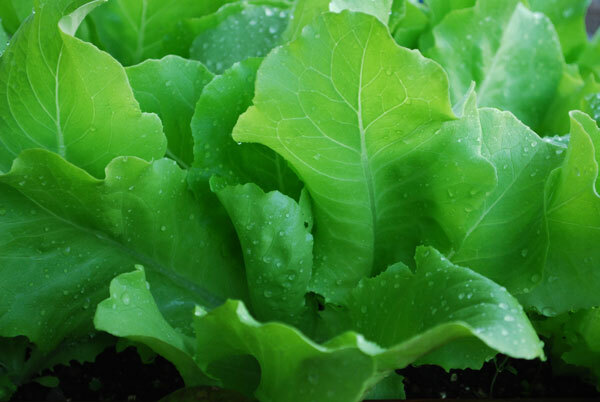 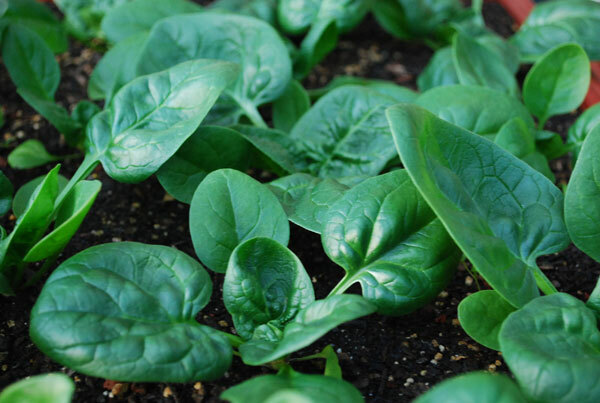 As long as they’re leafy vegetables that mature in the same time frame, anything goes!